While we do bobcat rescue, rehab and release in Florida, we will not relocate bobcats as state law requires that they be released very near where they were captured. 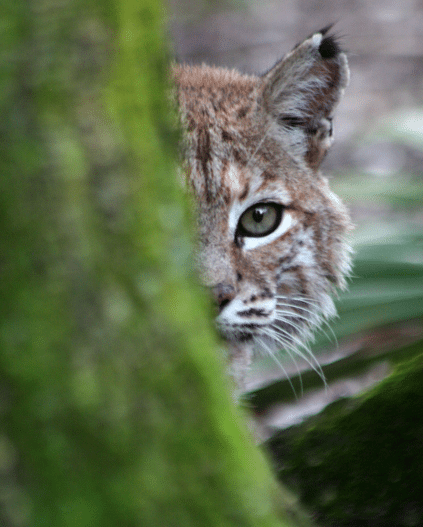 If you have a bobcat emergency in a state other than Florida, we can help you find a rehabber or will be a resource to wildlife rehabilitators who need help with bobcats, lynx or cougars. Big Cat Rescue has decades of experience rehabbing and releasing bobcats back to the wild where they belong. We provide huge, naturalistic enclosures where these cats can learn or perfect their hunting skills before being released back to the wild. We have trained staff who are experts at capturing an injured bobcat or hand rearing orphaned bobcats until a surrogate can be found. We go to great lengths to keep these wild cats from imprinting on humans and monitor their care via surveillance cameras to make sure they are thriving. When they are healed, or old enough for release (about 18 months of age) we find the best habitat possible for sustaining them and set them free to live out the life that nature intended. If you have a bobcat emergency in a state other than Florida, we can help you find a rehabber or will be a resource to wildlife rehabilitators who need help with bobcats, lynx or cougars. You may search our existing directory of Rehabilitation Centers/Rehabilitators here. 1. Do they have experience with bobcats? 3. Do they feed a live diet of prey to insure that the cats will be able to hunt for themselves? 4. Do they keep people, including themselves to the extent possible, away from the bobcat so that they do not imprint on people and end up approaching humans after release? 5. Do they have a vet on staff or on call 24/7 for emergencies? Rehabbing and releasing bobcats is much more difficult that the rehabilitation of most wildlife. These magnificent little wildcats need every opportunity to fulfill their role in nature and Big Cat Rescue is here to give them that second chance. Donate to make this bobcat rehab work possible. No one is allowed to trap and relocate bobcats so anyone who tells you that they will do that is probably trapping them to use as bait for training dogs.